08:01 PM - JessJohnson87 mentioned CrestedRick in post Possibly getting a Crestie in the future. 09:58 PM - CrestedRick mentioned CrestedL in post Normal behavior? 06:23 PM - CrestedRick mentioned booth2010 in post 55 Gallon Vivarium entrance showcase build. 11:22 PM - CrestedL quoted CrestedRick in post Normal behavior? 11:30 AM - booth2010 quoted CrestedRick in post Quick question on Pinstripe Crested Gecko prices. 11:36 AM - ofrell quoted CrestedRick in post Is this an egg? 08:40 AM - booth2010 quoted CrestedRick in post Quick question on Pinstripe Crested Gecko prices. 07:39 PM - Elizabeth Freer quoted CrestedRick in post Why is mesh required between substrate layers? 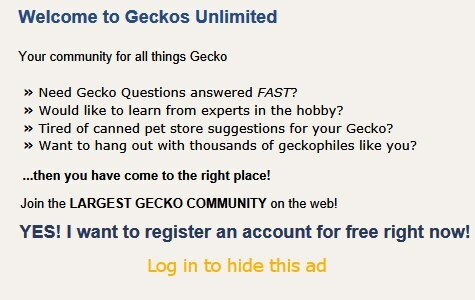 02:03 PM - booth2010 quoted CrestedRick in post Quick question on Pinstripe Crested Gecko prices. 06:42 PM - Elliriyanna quoted CrestedRick in post reptarium screen cage? 11:51 AM - Sophi quoted CrestedRick in post Crestie shedding question.